Pukerua Bay is a small sea-side community at the southern end of the Kāpiti Coast, New Zealand. In local government terms it is the northernmost suburb of Porirua City, 12 km north of the Porirua City Centre on State Highway 1 (SH1), and 30 km north of central Wellington. 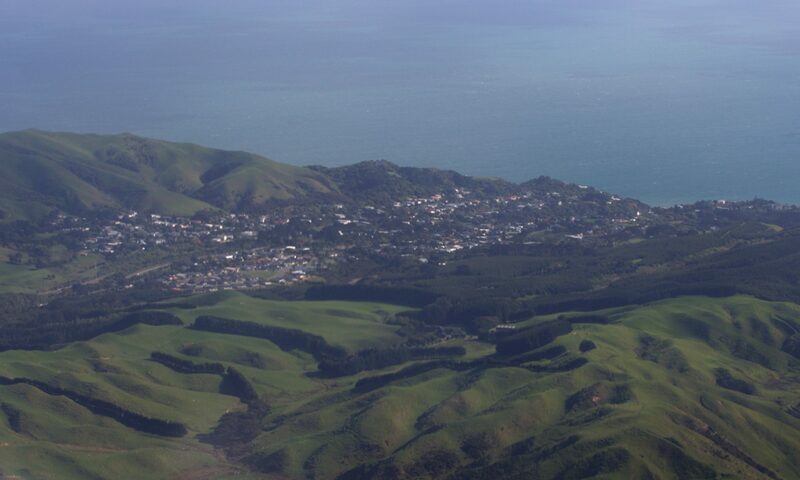 The majority of Pukerua Bay is situated in a saddle between hills, about 60-90m above sea level, offering sea views (and views of Kapiti Island in the north) from most houses. The coast around Pukerua Bay is fairly steep, with only a few houses nestled in a row behind the two sandy beach areas. In Maori, the words puke rua literally mean two hills but it is not clear which hills the name refers to. Pukerua Bay has a train station on the North Island Main Trunk Railway, with train services on the Kapiti Line provided by Tranz Metro. A second station, Muri Station, was closed in 2011. The community’s population is around 1,700 people. Pukerua Bay has a kindergarten, a pre-school, and Pukerua Bay School, which caters for ages 5-12. Commuters by train benefit from the close proximity to Porirua (15 minutes by train) and Wellington (35 minutes by train), making Pukerua Bay an attractive choice for people working in these cities. Families with children value the semi-rural surrounds and enjoy the unspoilt local beaches and coast. Pukerua Bay has a moderate, maritime climate with slightly higher sunshine hours than Wellington and less wind. In general, the weather is comparable to that of the lower Kapiti Coast. Pukerua Bay’s local shops include a dairy (“Pukerua Bay Store”, open 8am-8pm Mon-Fri, 9am-8pm Sat & Sun), the well-stocked second-hand bookshop Archway Books, and the award-winning hairdresser & beauty salon Reds. The residential areas of Pukerua Bay range from older houses (pre-1950s to 1960s) – with sections typically well covered with trees and bush – to later more suburban-style areas and the new St. Mary’s Estate subdivision at the southern end of Pukerua Bay.